Way back when I was in elementary school, I had a super awesome babysitter named Mary. I was a pretty cool kid so Mary didn’t mind hanging around with me….it probably didn’t hurt that she was getting paid…but I honestly think she liked having me tag along. We sneaked into rated R movies (that’s when I first saw STIR CRAZY), broke into her older boyfriend’s place one night, went tubing with her hot teenage girlfriends, and generally just had a bunch of fun together. Anyway, back to the records…Mary totally turned me on to DEVO (she actually partied with the boys after a show and brought back a DEVO hat to prove it!) 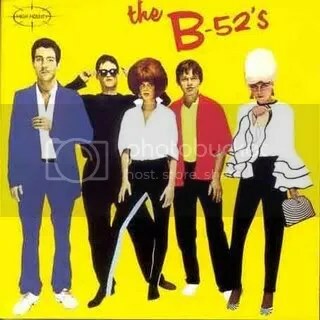 and THE B-52’s! I still love me some DEVO and that first B-52’s LP is a personal favorite. For some vintage late 70s performances of these kooky kids, check out KELLY MILLS’ YouTube channel! And how could I not leave you kids with one of Fred’s gaytastic hits? This song is so retarded that it goes full circle past genius right back to retarded….which is why I love it. Thank (or hate) me later! I still remember when I first saw it.